It is not a secret that defining and differentiating meaning and purpose continues to be a challenge for researchers and practitioners alike. This became apparent to me in the course of reviewing the literature while writing my book, The Path to a Meaningful Purpose: Psychological Foundations of Logoteleology. And since publishing the book back in 2013, the debate continues. I must also state that my approach through this book is not to disprove and challenge others’ theories as wrong; rather, my goal and resolve is to offer a framework that is valuable, relevant, and meaningful. Simply stated, I doubt my infallibility, and do not believe that my theory and definitions are above anyone else’s. My goal has been and continues to be to solve real life problems using sound theory and practical methods. Such a goal requires clear definitions, and I was ready to take a stand for the sake of my clients. Hereafter I will use meaningful purpose psychology (MPP) and its scientific name, logoteleology, interchangeably. the idea that a person wants to express by using words, signs, etc. Pertaining to what a person wants to express, British analytical psychologist Dale Mathers (2001) summarized well what the combined intended meaning and the decoded meaning denote: “Meaning is an act of communication, rather than a communication” (p. 3). Here, communication is a two-way exchange that succeeds when both parties are “on the same page” or when understanding is shared and mutual. Hence, there is a shared meaning. In MPP, we use these definitions of “meaning” or “to mean” to explain how individuals intend, convey and grant significance and value. For a more in-depth explanation, please refer to the article in my blog, Meaning, Meaningful and Important: The Powerful Three. WHAT IS MEANINGFUL AND MEANINGLESS? In MPP theory and method, the meaningful builds, enhances, and points to what is significant and beneficial. Acting in a meaningful way intends to honor, respect, exalt, validate, and value something and someone. For instance, you probably believe that your country’s flag is meaningful because of what it represents—the kinship with fellow citizens, the country’s history, its language, culture, and traditions—all which have a special significance in the flag’s colors. You would also agree that, for some individuals, serving and doing good to others is meaningful. This is consistent with psychological literature where meaningfulness is defined “as a generally positive or beneficial outcome for individuals and organizations” (Berg, Dutton & Wrzesniewski, 2013, p. 82). Pratt and Ashforth state, “By ‘meaningful,’ we mean that the work and/or its context are perceived by its practitioners to be, at minimum, purposeful and significant” (Pratt and Ashforth, 2003). Joseph F. Rychlack (1994) defines meaningfulness as “the extent of personal significance that a particular meaning has for the individual concerned.” In contrast, the meaningless is something or someone we could consider useless, trivial, worthless, insignificant, as well as having low value. For many of us it is not difficult to discern what is and is not meaningful behavior.Hence, meanings can be meaningful or meaningless. Meaningful behavior is outward looking, while meaningless behavior is inward looking. WHAT IS IMPORTANT AND UNIMPORTANT? In MPP theory, “important” does not equate “meaningful.” Nor does “unimportant” parallel “meaningless.” In MPP, a person can give importance to the meaningless, as has been defined in this article. Figure 1 presents four behavioral options individuals and institutions can follow and apply. The important and meaningful displays behavior intended to edify and improve. For instance, I can choose to recognize a peer for a job well done. The unimportant and meaningless indicate behavior that avoids demeaning others. As an example, I decide not to infer that my theory and method is better than others’ approaches. The important and meaningless bears out behavior intended to demean and degrade people. As in the case of a bully in a school yard who verbally and physical abuses others. The unimportant and meaningful reveals behavior that neglects to build and edify others. As when a person chooses to neglect recognizing another for her or his good performance. Based on these explanations, options one and two are more acceptable and worthwhile. Options three and four should be avoided at all cost. In the MPP method, and consistent with psychological theory, purpose fulfills meanings. Let me provide a simple example of meaning and purpose in action through an individual’s professional meaningful purpose (Marrero, 2013, p. 164). I publish children’s books in order to promote the love of learning. In the MPP method, a meaningful purpose must answer three questions, the first related to the purpose, the second to the beneficiaries, and the third to the meaning. Hence, the intended meaning is to encourage the love of learning. The meaning is fulfilled through the purposeful actions of publishing and promotion. Here is an example from the corporate world. The on-time airline of the business traveler. 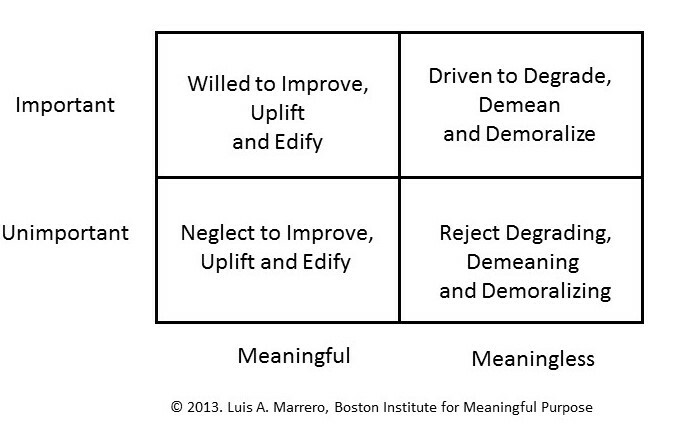 As you can see from the previous examples, the role of purpose is to fulfill a meaning. Notice that purpose entails the use of verbs. In our method, meanings provide the why, while purpose provides the what and how. To overcome the tendency of treating meaning and purpose interchangeably as if they are the same, I went to the Greek dictionary and concordance to help me differentiate between both. Here is what I found. Hence, in our method, as previously explained, meaning (logos) is how something or someone is defined, as well as an intention or reason for doing something; while purpose (telos) is the fulfillment or consummation of the meaning. One intends, the other accomplishes. Meanings are fulfilled through purposeful action. Using the Meaning / Important Quadrant, and understanding the consequence of each of the four options, the client is encouraged to take responsibility (self-determination) for her or his life, and to choose which path to follow. If the client selects to give importance to the meaningful, she or he is encouraged to commit to a meaningful life purpose consistent with her or his choice and strengths. For more information on how to leverage these definitions for coaching, therapy, counseling, and Organization Development consulting, please contact the author (luis@bostonimp.com). Comments and questions are also encouraged. Copyright 2017 Luis A. Marrero. All rights reserved. Berg, J. M., Dutton, J. E., & Wrzesniewski, A. (2013). Job crafting and meaningful work. In B. J. Dik, Z. S. Byrne, & M. F. Steger (Eds. ), Purpose and meaning in the workplace (pp. 81-104). Washington, DC: American Psychological Association. Frankl, V. E. (1998). The will to meaning: Foundations and applications of logotherapy. New York, NY: Meridian. Marrero, L. A. (2013). The path to a meaningful purpose: Psychological foundations of logoteleology. Bloomington, IN: IUniverse. Mathers, D. (2001). Meaning and purpose in analytical psychology. Philadelphia, PA: Taylor & Francis. Rychlak, Joseph F. Logical Learning Theory: A Human Teleology and Its Empirical Support. Lincoln: University of Nebraska Press, 1994. What is Meaningful? And why knowing matters?